Categories: Cards | Tags: Card making, Cards, Happy Birthday, rubber stamps, stamping, Stamping Up, Verve Stamps | Permalink. So beautiful and I love to see one layer cards. Your work is wonderful with the colored pencils. Beautiful one layer card. 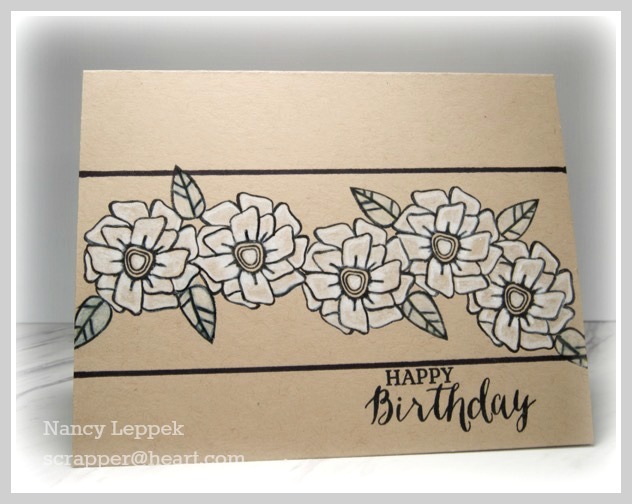 Love those flowers colored in white on kraft. The drawn black lines make it look likes it is layered. Great job. I am sure the recipient loved it. One layers aren’t my favorite either, Nancy, but this is fantastic. 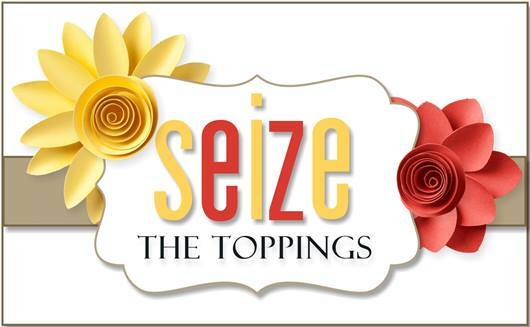 Not only the way you laid out the flowers but the white coloring on kraft. Love this Nancy. Beautiful one layer card. I love your commentary as much as I loved your card. I was laughing, but not at your card. One layers are not my usual either. Gorgeous card, Nancy! I love the shaded white flowers. And your leaves are fine! I love those flowers and would NOT have noticed your slightly darker leaf! I love your one layer card…kind of scary, but fun to push ourselves sometimes…OMG we are getting a downpour right now and we have the Rose Festival Parade going on…maybe they are done with it…hope so, a lot of people and horses are getting very wet! Have a fun day friend! I love the look of white pencil coloring on kraft!!! And I like that you added some green on the leaves, Nancy! Awesome job to mix up different stamps! SHE LIKES IT!! SHE LIKES IT!! : ) Oh Nancy I was twice blessed to see this card here today : ) Thank you from the bottom of my heart for sending this delightful card to me!! I really do love it and I am so blessed by our friendship!! This is really pretty Nancy! Love the white on kraft.